Now I know you might be thinking: It’s Spring! What’s she doing getting all caramel-y and apple-y on me? Shouldn’t it be all rhubarb and strawberries? Well, yes and no. It’s still chilly here in New England, and the farmer’s markets are full of the remnants of winter…that is, the leftover apples until all of the summer fruits start coming in. 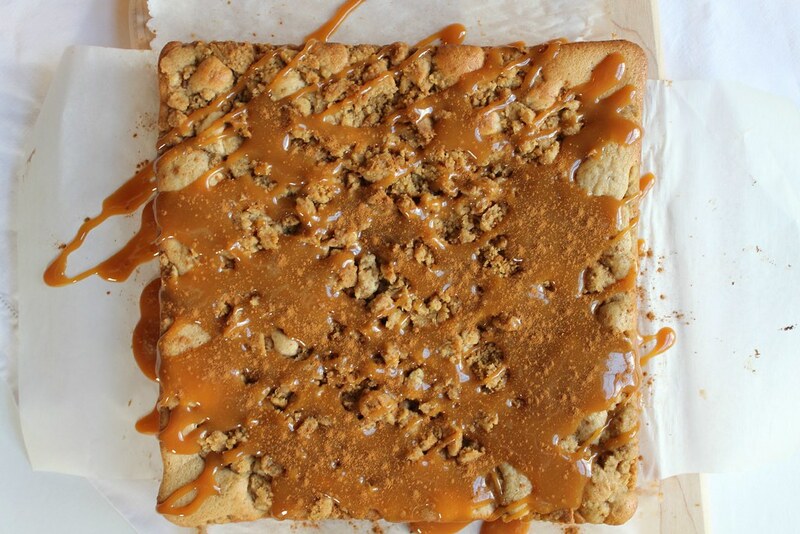 So what better way to eat the last of the apples than with a thick crumb coating and a generous drizzle of caramel? 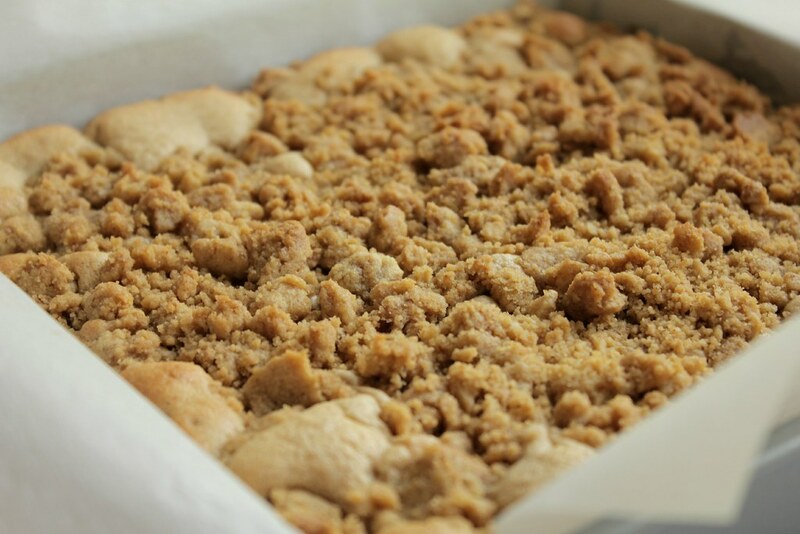 Crumb cake is one of the most satisfying baked goods, I think. The sturdy base and hefty crumbs hold up to coffee particularly well. The caramel makes this fit for even the heartiest sweet tooth, so a glass of milk is also a welcome companion. This is the sort of cake you leave on the butcher block island with a fresh pot of coffee. When you come in from raking the remnants of winter out of the garden (we certainly don’t plant anything up here until June 1 for fear of frost), the entire cake has mysteriously disappeared into the eager hands and mouths of anyone who might cross paths with its heavenly scent and glistening, crumb-topped glory. But now I’m just slipping into poetry-mode. Suffice to say: make this now. Your house will smell absolutely wonderful and I guarantee when fall comes around the smell will return to you and this cake will once again find its place on your butcher block island with a fresh pot of coffee. Preheat oven to 325 degrees F. Grease an 8×8 inch pan and line with parchment paper. To make the crumb topping: Stir together the sugars, salt, and cinnamon. Add the melted butter and stir until combined. Add the flour, mixing well as it creates a dough of sorts. Let sit while you make the cake batter. To make the cake: In a large bowl, whisk together the flour, sugar, salt, cinnamon, and baking soda. Cut in the butter until it becomes an even grainy texture. In a measuring cup, mix together the vanilla, buttermilk, egg and egg yolk. Add to the dry ingredients. Beat for 1 minute until smooth and light. Fold in the chopped apples. Spread the batter into the prepared pan. Now break the topping into medium-sized pieces and evenly distribute over the batter. Bake for 25-30 minutes or until a cake tester comes out clean. To top: Drizzle with warm caramel sauce and sprinkle with cinnamon. Cut into 16 squares to serve. Beautiful! This looks so good! I was eating apple everything in the fall, I want to make this now! Um, such a good point!!! Caramel-apple #allthetime! Looks delicious!! Especially that topping! Yum! What a perfect combination! I need this now! Wahooo!! Nice to meet you, Natalie! This is one gorgeous crumb cake. 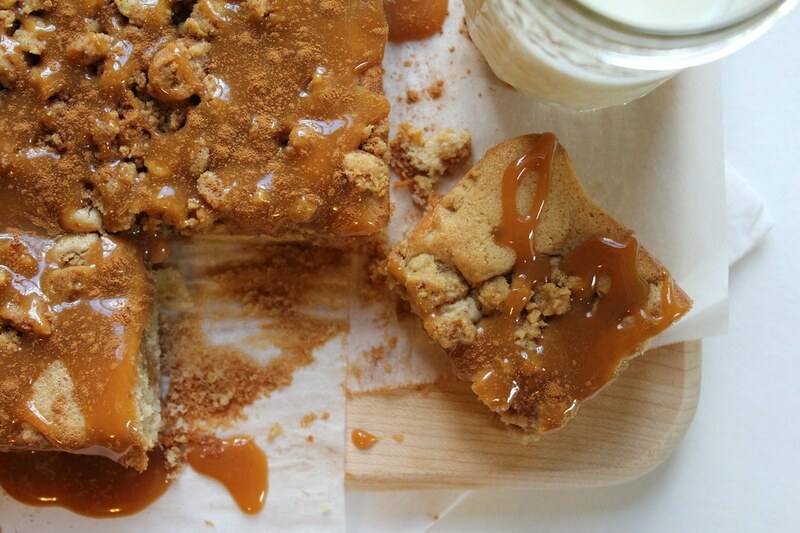 I love apple crumb cakes and that caramel is just sealing the deal for me. Delicious! As if I could ever turn down crumb topping drenched on caramel!! This is one amazing, cake, Natalie! Have a glass of cold milk and a cup of coffee at the ready, Kelli! This cake looks incredible, love the crumb and caramel topping! What a cake! Caramel my favorite, Pinned it for me to make! Good golly that cake is impressive! I just love crumb cakes, and with caramel too? Heaven! Really delicious looking apple cake! I just picked some apples from the farmers market!! I love crumb cake as well! If it’s with apples it’s all the better! And the caramel sauce on top? Delish! !